This post quickly reviews the state of Brazil, its economic transactions, its political institutions and the level and prospects of its human capital. The article is short on text and prolific on charts for brevity, because “an image is worth a thousand words”. The conclusion is that Brazil is dependent on foreign capital, on a leveraging path of booming private and public consumption aided by slow but consistent monetary easing, on a backdrop of poor educational performance, limited R&D and economic inequality and political moral hazard that facilitates corruption. The people are lovely and the weather is great, but if you don’t know the right brokers and are unwilling to pay upfront, it sounds like a difficult place to do business. 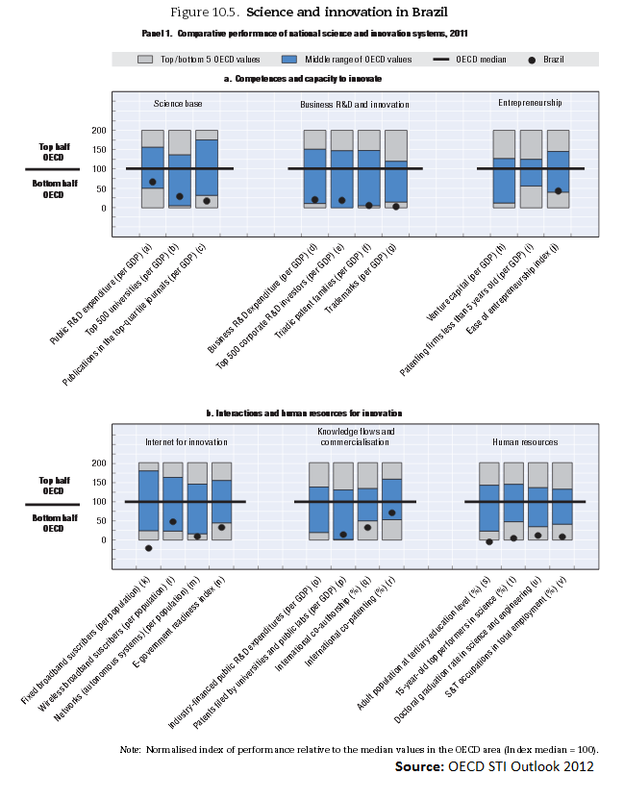 Seems to me like a lot could be done to improve living conditions by increasing the tax rate for the top income bracket, increasing public expenditure on infrastructure, R&D and education and incentives (tax breaks) for private investment in these sectors as well as reinforcing the control on corruption and on the government spending. The flow of cash in the economy is as good a place to start as any. It allows us to understand the sustainability of Brazil’s international position, its ability to maintain ownership of its assets, the growth of wealth in the economy, the economy’s reliance of fiscal and monetary easing and the evolution of working conditions. … which allowed it to accumulate substantial forex reserves. However, the currency has fallen substantially recently, and as a result the state has had to start intervening in forex markets to stop the depreciation of BRL. As a result of the balance of payments dynamics and foreign exchange dynamics described above, the yields on 10yr Brazilian government bonds have inevitably gone up. My sources tell me that the prevailing narrative is that this ongoing problem is caused by QE, and certainly the recent ups and downs of the currency seem to match the Fed’s signals quire well. The USD begins appreciating against the BRL at the end of May, peaks at the end of August falls from then onwards. Looking at debt markets, my first instinct, baptised in Euro-Zone crisis-fire as I was, is to always look at what is happening to the government. At first sight the evolution of Public Debt/GDP seems encouraging. However, the confidence inspired by this relative decrease should not be allowed to hide the underlying trend of rising nominal government debt. Moreover, looking at the composition of bond holders shows that never before, on nominal terms has so much Brazilian government debt been held by foreigners. However, it is important to bear in mind the relative significance of this nominal value. Indeed, according to the treasury’s August 2013 figures, only 13.72% of its debt is held by non-resident investors. Nevertheless, the Brazilian economy has become increasingly leveraged, with loans to the private sector increasing to 2.5 times their level in 2008. Another, perhaps more alarming sign of these leveraged times is the substantial amount of complex shadow banking going on, if the difference between M3 and M0 supply is any indication. Problematically, the stock market has remained relatively stable. Meaning that the extra cash is there mostly for the accounting purpose of shoring up bank accounts, much as it does in Europe and the US. At the same time, output has not performed particularly well since 2008, with the exception of the usual, not-sustained one-off fiscal stimulus recovery in 2010. This pattern is confirmed by the evolution of Brazil’s industrial production index. A large amount of this has been down to consumer spending, which has risen non stop over the last 20yrs, increasing more then 4 times over. 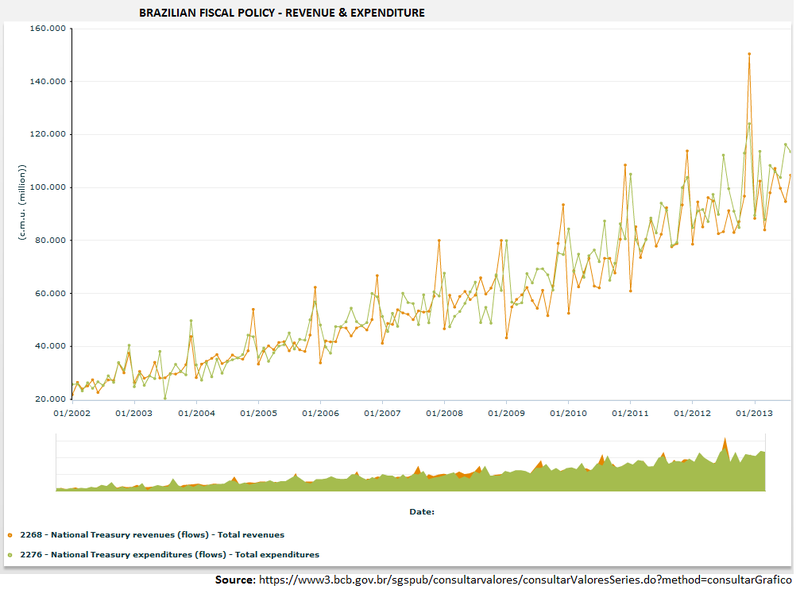 However, a similar trend can also be seen in investment, so that Brazil has not just been consuming. To understand the path of government debt described above, it helps to compare the path of government expenditure and that of government revenues. The obvious observation from the data below is that a lack of control on expenditures is what has been driving debt growth rather than an inability to collect taxes. 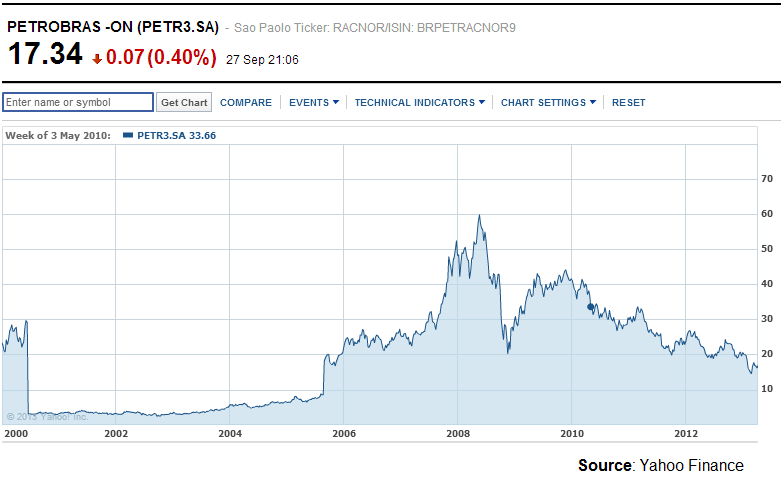 2012 in particular seems to have been a peak in such profligacy. My understanding is that the main source of Brazilian expenditure is social programmes, particularly housing and poverty relief ; and discretionary projects, such as the 2014 World cup and the 2016 Olympic games. 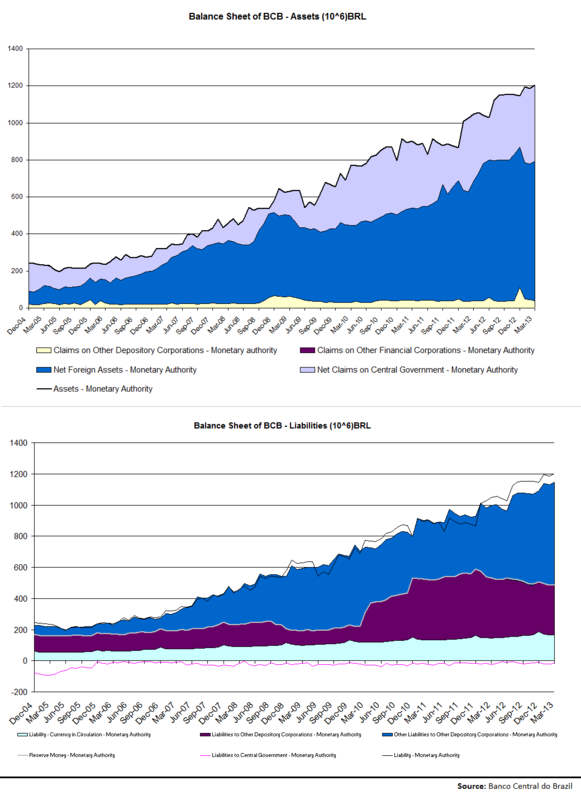 … and by less orthodox means, by expanding its balance sheet. Of course this is still a far cry from the QE programmes and accommodations facilitated by the Fed, the ECB, the BoE or the BoJ. Nevertheless, it goes to show that the recent stagnation described in the previous section has not come about through lack of reaction on the part of policy makers. Meanwhile, wages and labour costs have continued to rise, making the economy consistently less competitive. Nevertheless the economy has performed well enough that the unemployment rate is at 10yr lows. However, it is likely that the fall in unemployment is due to the increased demand, which itself is based on borrowing that may not be sustainable. While Brazilian inflation is not enormous by historical levels that says more about the scale of past Brazilian woes than about its present success. Indeed, 6% inflation with flatening GDP is a disturbing sign that may be considered an early indication of stagflation, possibly pointing to a rise in unemployment in the near future. With output recently stagnating, while loans continue to increase, facilitated by an enormous amount of housing subsidies by the federal government through a panoply of development and state banks, Brazilians have more money to spend on the same goods, which causes inflation. More importantly, we know that the present level of Brazilian inflation does not reflect market price growth, but rather government controlled energy price growth, which has caused a fall in the stock price of Petrobras. When researching Brazil there is one consistency above all others: The government’s activist attitude to policy. Indeed, aside from the usual fanfarre of curruption and political bickering, Brazil’s politicians are much more active than I have been used to. 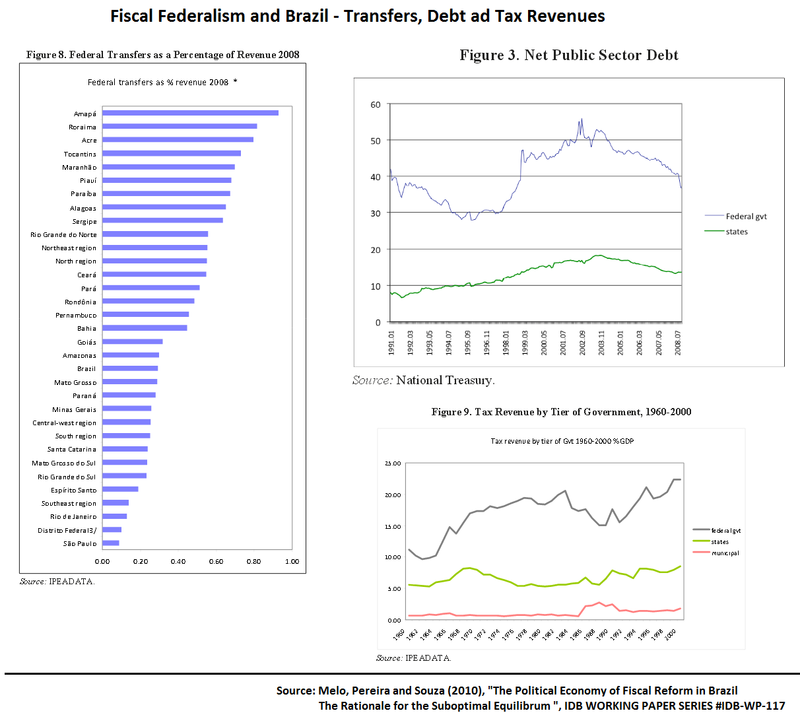 Even in comparison to their Chinese homologues, Brazilian politicians willingness to charge a tax on financial inflows and to lift it (to surprising negative effect that revealed that much money was apparently stuck in because investors did not want to pay taxes on the way out), to politically motivated price controls, to forex intervention and football stadia, there seems to be no lever Brazilian politicians will not pull or push. Ultimately, this tells me they don’t really know what they are doing and that ultimately investors should really do a lot of homework before heading to Brazil. INSTITUTIONAL BACKGROUND – Political Freedom, Corruption, Rule of Law and Moral Hazard in Politics. Reviewing the institutions underlying economic environment sheds some light into those variables that facilitate or undermine transactions, but which economists have traditionally overlooked or assumed out of our models, but has now become more mainstream. Institutional Economics is now a rich field of research which has grown relatively recently, which focus on these more qualitative variables, and a strong overlap with Political Economy and Public Choice. Much as there is a multitude of transaction-based variables, so there is a rather voluminous amount of competing, soft, qualitatitve institutional variables. For simplicity, I focus on four issues inspired by Acemoglu and Robinson (2013) (reviewed here), Olson (1965) and Barro (1996) : Political Freedom, Moral Hazard in Politics, Corruption and Rule of Law. Problematically, there’s some overlap in the measurements, but in the discussion below I try to isolate that whenever possible. Democracy matters because it forces decision makers to internalise the needs and preferences of the wider population, rather than simply those of a smaller sub-set which supplies it with armed or financial support, often at the detriment of the population. 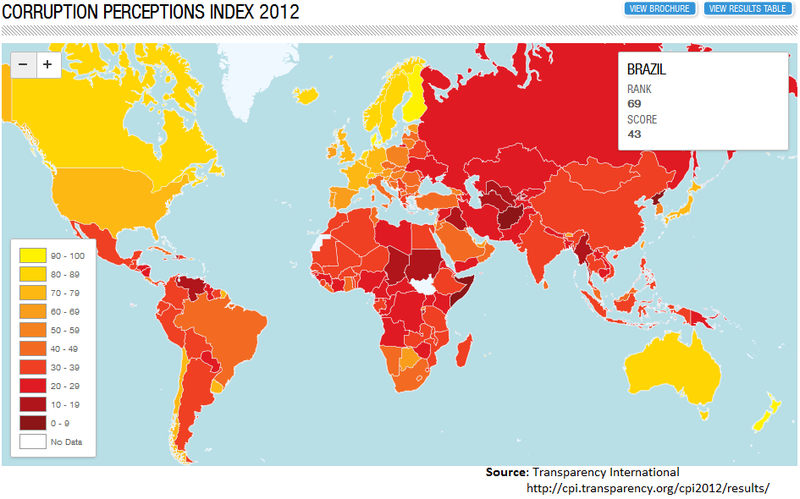 According to Freedom house, Brazil performs well from a freedom perspective, ranking as a “free country” as of 2013. This is a relevant variable that generally measures democracy, political rights and freedom of expression and so is relevant for its insight into whether people can hold their government accountable as well as go about their business without being threatened by the state. Moral Hazard in Politics measures collective action problems along the lines of Mancur Olson, adds a level of detail that is relevant to understand the feasibility of and extent to which interest groups are able to capture rents because of the features of the political system. This is an issue concerned with conflict of interests, transparency, checks and balances and the ability of officials to evade monitoring of their actions. 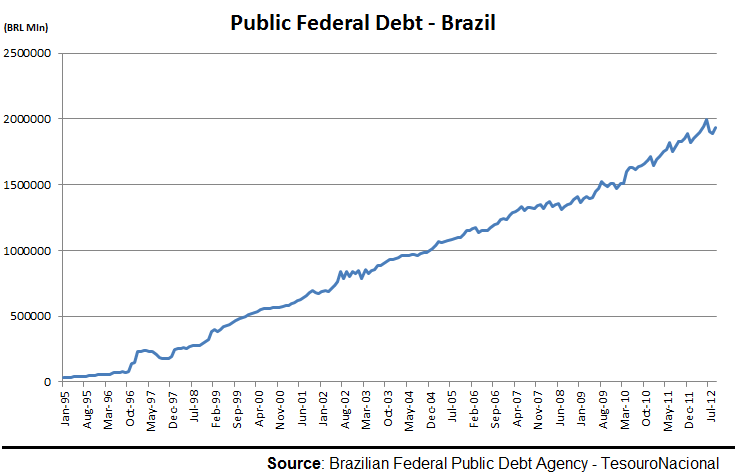 This has a number of dimensions to it, all of which begin to raise serious problems in Brazil. 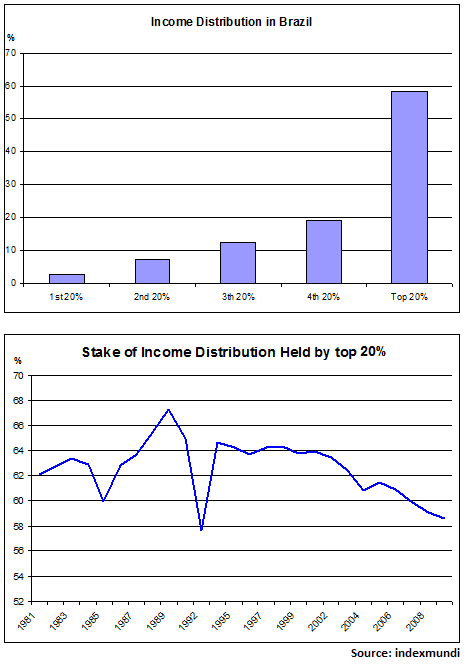 Income inequality creates small but well endowed groups that would be better at capturing government. Brazil is (or at least was as of 2009) an extreme example of income inequality, although nothing as bad as South Africa, which is of little relief. Clearly the situation has improved as is shown in the figure above. 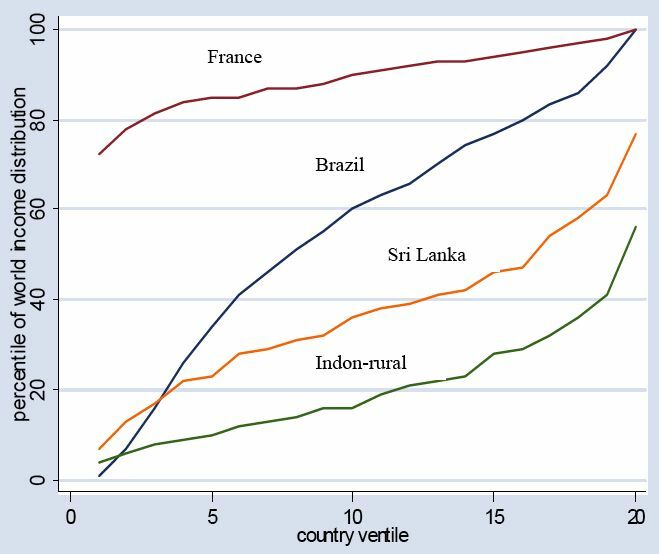 However, to get a sense of relative significance, Milanovic (2006) offers the following graph below, that shows that the poorest of the poor in Brazil are poorer than the poorest Indonesians but the richest of the rich are as rich as the French. Centralisation offers an opportunity for wider scale effects and wider moral hazard, by spreading the costs and concentrating the gains even further. Once again, data from Melo et al (2010) shows that the ground is set for this to happen in Brazil given the prevalence of political centralisation. Insufficient political checks and balances makes it relatively cheap to buy desired policies, because it is necessary to only bribe few veto players. 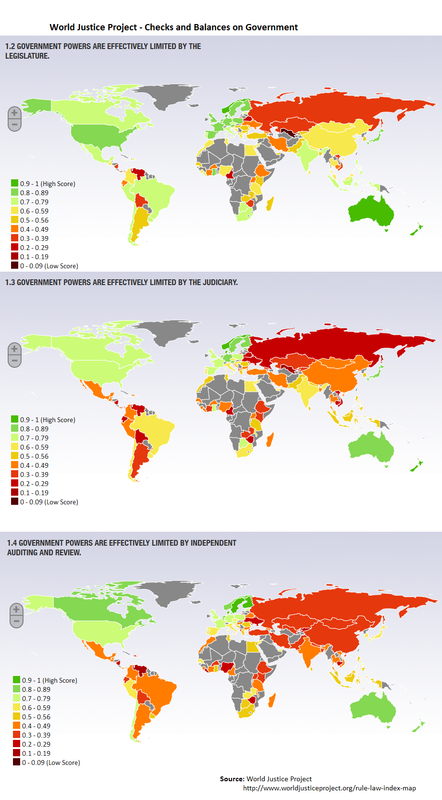 The World Justice Project surveys a number of interesting variables regarding checks and balances, which offer a mixed picture. While the legislature has strong powers of oversight, the judiciary and independent auditing agencies are left behind. The existence of non-political monitors adds a layer of monitoring that cannot be as easily lobbied as the rest for it’s own purpose is to find moral hazards. The main indepent auditing agency is the “Tribunal de Contas da Uniao” (TCU). To this, Melo et al (2010) add the role of state level Courts of Accounts and highlight their fragilities as “the Achilles’ heel of the sustainability of the Fiscal Responsibility Law “. Given the afore mentioned set up of politically prone moral hazard institution, it is not surprising that Transparency International finds widepsread corruption in Brazil. The figure below should help put things into perspective. 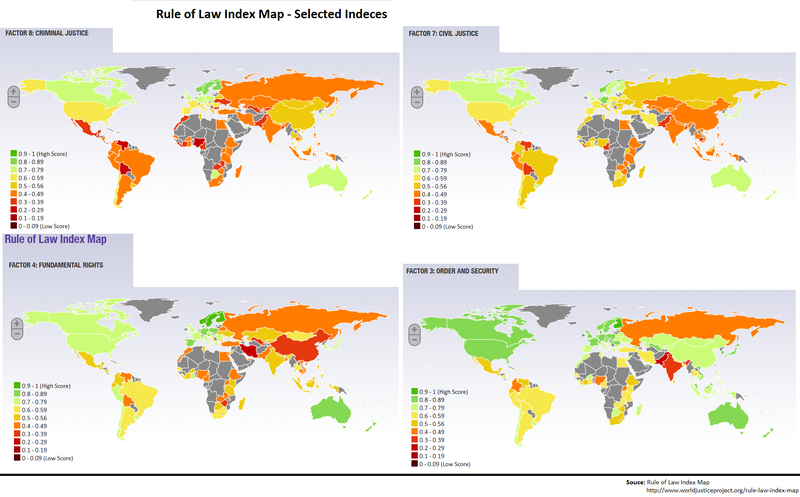 It maps countries’ performance according to selected Rule of law indeces and allows for a clearer comparison with benchmark developped countries. Last but not least, Barro (1996), Benhabib and Spiegel (1994) and Schleifer (2004) have conclusively shown that human capital is of crucial importance to understand the growth path of countries and their ability to exploit. 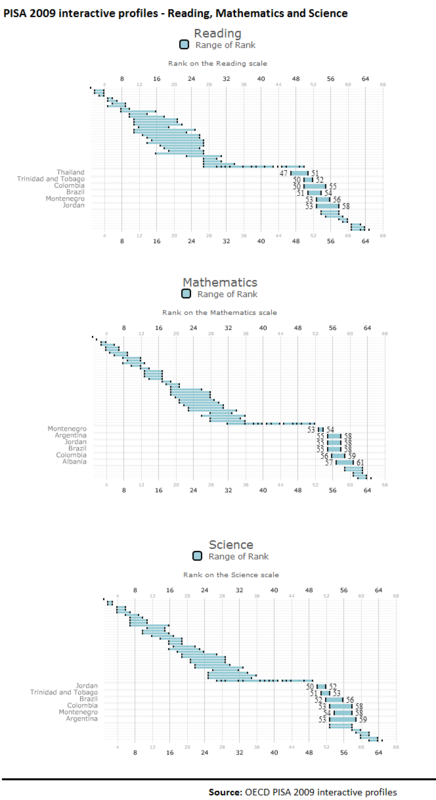 According to the OECD’s PISA 2009 survey data, Brazil ranks increadibly low in terms of most educational variables, including reading, mathematics and sciences. Ultimately, this lack of human capital adds bottlenecks to Brazilian contributions to R&D. Brazil is dependent on foreign capital, on a leveraging path of booming private and public consumption aided by slow but consistent monetary easing, on a backdrop of poor educational performance, limited R&D and economic inequality and political moral hazard that facilitates corruption. The people are lovely and the weather is great, but if you don’t know the right brokers and are unwilling to pay upfront, it sounds like a difficult place to do business. Seems to me like a lot could be done to improve living conditions by increasing the tax rate for the top income bracket, increasing public expenditure on infrastructure, R&D and education and incentives (tax breaks) for private investment in these sectors as well as reinforcing the control on corruption and on the government spending. This entry was posted in Brazil and tagged Balance of Payments, Banco Central do Brazil, Banco Central do Brazil Balance Sheet, Bond markets, Brazil, Centralisation, Checks and Balances, Consumption, Corruption, current account, Democracy, Economics, Education, Financial Flows, Fiscal Federalism, Fiscal policy, Forex, Freedom, Gross Fixed Capital Formation, Human Capital, Income Distribution, Income Distribution Brazil, Inflation, Monetary Policy, National Accounts, Political Institutions, R&D, Rule of Law. Bookmark the permalink.